Microsoft has changed the Windows operating system considerable with the release of Windows 8. While it should not take experienced users longer than half an hour or so to get acquainted with the new features and work flows, it may be more difficult for inexperienced users to know how to work with the operating system. While instructional screens and videos may be solid options to get a quick overview of the new features of Windows 8, some users may prefer ebooks instead that explain all the concepts in detail. Several free Windows 8 related ebooks have been released in the past two weeks, often to promote the operating system itself or devices that ship with it. While that usually means advertisement of some kind or the requirement to fill a form before you can download the ebook, it does not at all mean that you won't get the information that you are looking for out of the offerings. The book starts with a short introduction on how to read the book and use the information. The author provides these information for mouse, keyboard and touch screen users so that every input method is covered in the book. The most important chapter of the book is the first one, as it introduces the start screen with all of its new features. It also explains how to go to the traditional desktop, and goes into detail about the changes there in the second chapter. It covers the sign in process, how the start screen works, how to work with the new Charms Bar, how you can load the traditional desktop, and how you can check out free apps. It should not take too long to read the ebook, considering that the text font is rather large and that it contains images and screenshots as well. Some chapters may not look like much, like the engaging the social apps chapter, when in fact it is quite interesting considering that it covers setting up email, the calendar, and adding accounts. The book provides you with solid information about Windows 8 and the majority of its new features that you will encounter. Experiencing Windows 8 - Walk-through the new UI and key improvements to Task Manager and File Explorer. To get a download link you either need to tweet to promote the ebook on Twitter, or to contact the author via email to get a direct download link instead. It is far from ideal if you ask me and I'd suggest the email option unless you do not mind promoting a Windows 8 ebook on your Twitter account. Update: Microsoft has posted the download link here. Just visit the site and click on the link in the article to download the pdf ebook to your computer. The Windows Store needs to be pushed, and what better way to push it than to offer free programming ebooks for developers? The free ebook has been released in pdf format. You can download it and its companion content from this Microsoft Press web page. Thanks go to Jojo and Ilev for sending me information about those books. 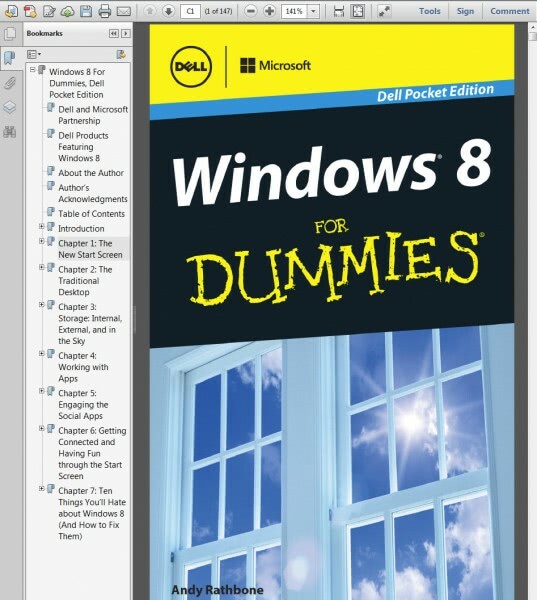 Do you know of other Windows 8 ebooks that are free to download? Post links in the comments and I will add them to this list. To get the Windows 8 for IT Pros book, one must use the PayWithATweet system, which, to my mind, is too dangerous. It can even update your profile. Are you kiddin’ me? An early mentor in my life, Ed Walsh, was the father of an old just-after-high-school girlfriend (God rest his soul); and one of his favorite sayings (which, of course, I had heard before him, and a gabazillion times since, but he had a certain way of saying it at the just perfect moments to give it more meaning) was “there ain’t no free lunches.” Everything has a price. And while I’ve found in my 56 years (just about the same age as Ed was when, while doing his routine 50 morning push-ups, he dropped dead of a heart attack) that there actually are some amazing truly free things in life, the painful truth is that they are the exception, and not the rule. In our zeal to get our hands on these things, we have to be really careful what we agree to. Look more closely at what PayWithATweet requires of/imposes on those who use it! I’d be happy to Tweet about it to get a free copy if I didn’t have to go through the outrageous PayWithATweet system in order to do it. That I must speaks to the free eBook author/publisher’s nefarious intentions. Sorry for being so critical, but all the apps on Facebook and Twitter are making me very upset, in part because some of them use the permission I gave to my friends and/or followers to post on my either Twitter or Facebook page to do their own posting. In other words, once one of my friends or followers on Facebook or Twitter, to whom I’ve given permission to post on my Facebook or Twitter page, sign-up for one of these godawful apps, then next thing I know it’s the app, and not my friend or follower, that’s posting on my page. Why more people aren’t outraged by that I do not know; but my friend or follower sure gets an earful from me whenever it happens. Most of them — and I mean something like 99% — have no idea what they agreed to and/or authorized when they signed-up for the app. I humbly request of Ghacks, whom we all trust and love, to be better a better steward of that trust and not link us to stuff that’ll hurt us… or at lest warn us, in bolded all caps or something, that it’s coming. That, actually, would be good enough. Otherwise, of course, and as usual, good work, Ghacks! Thank you. Gregg you can also request the download link by email like I mentioned. nice graphic but i want to clear as if windows xp creash v can repair by option, i want to know is there any option or other way for this type sitution, and can we run c, c++ or required any link or that.